Indicia: VICKI Volume 1, Number 3, June 1975 is published bi-monthly by Atlas Comics. Executive offices and office of publication 717 Fifth Avenue, New York City, N.Y. 10022. Subscriptions in U.S., Canada and possessions $1.50 for six issues. Application to mail at second class postage rates is pending at New York, N.Y. and at additional mailing offices. ? Copyright 1975 Seaboard Periodicals, Inc. All rights reserved. 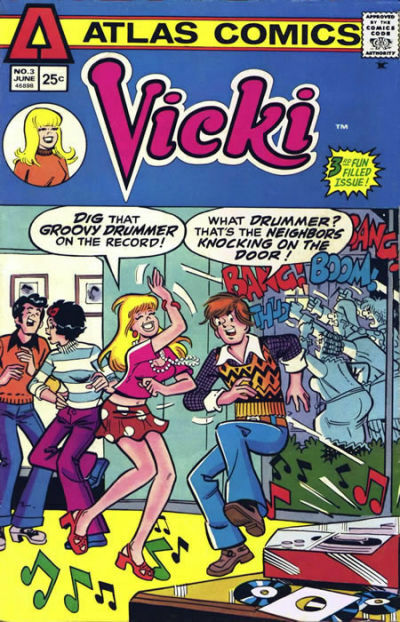 VICKI is a trademark of Atlas Comics, a division of Seaboard Periodicals, Inc.